For more than half a century the international community of nations has recognized education as a fundamental human right. In 2000, it agreed to the Millennium Development Goals, which acknowledged education as an indispensable means for people to realize their capabilities, and prioritized the completion of a primary school cycle. Notwithstanding the centrality of education in treaties, covenants and agreements, the international community has yet to recognize the full potential of education as a catalyst for development. While many national governments have increased their commitment to and support for education since 2000, its emphasis among donors and in many countries remains vulnerable to shifting conditions — financial and otherwise. In the coming months the international community will create a space to re-consider its commitments and obligations to the young and the marginalized in the world, whose voices are often muted. Working together it is imperative that all interested stakeholders recommit themselves to unlocking the transformative power of education. An important step can be seen in the outcome document of the Open Working Group on Sustainable Development Goals (released in July 2014), which reiterates that education is not only an end in itself but also a means to achieving a broad global development agenda. 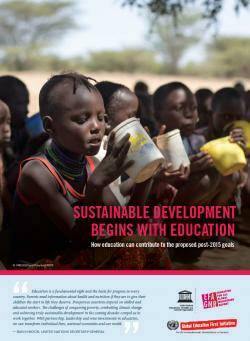 This policy paper provides a succinct, evidence-based overview of the numerous ways in which education can advance the proposed post-2015 sustainable development goals. It underscores the notion that sustainable development for all countries is only truly possible through comprehensive cross-sector efforts that begin with education.